Which surgical complications following a procedure on an infectious flexor tenosynovitis may be expected? Is it possible that nerves get injured during surgery on flexor tendon phlegmons? Complications associated with nerve and/or blood vessel injuries during surgery on deep-laying hand infections are possible! Is it possible to lose a finger due to an infectious flexor tenosynovitis? The most common complication of – not the surgery but the deep-laying hand infection – is a mobility malfunction. This is hardly surprising if you consider that the tendon sheath represents the sliding layer for the flexor tendon. After a severe infection (and surgery) to a tendon sheath, the gliding motion of the flexor tendon is considerably compromised. Only a surgical approach at the opportune time can prevent the development of substantial mobility malfunctions as a result of adhesions. Physiotherapeutic exercises many times are very beneficial to support the healing process of the infection; nonetheless this alone oftentimes does not provide a full recovery. Yes, this is possible. The vastly inflamed tissue makes it hard to visualize the area in the fingers, despite the bloodless operating surface secured through a cuff to the upper arm. Plus, many times the inflammation spreads onto the adjacent nerves and blood vessels, making it necessary to remove the affected areas as well. These injuries on finger nerves or blood vessels are not uncommon at all, particularly if the infection progressed into the deep layers of the hand. Position of the flexor tendon (blue arrow), tendon sheath (green arrow) and nerve (red arrow). 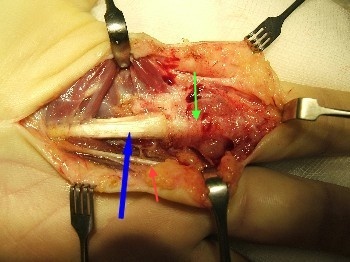 The image shows the close proximity between the flexor tendon (blue arrow), tendon sheath (green arrow) and the nerve (red arrow). Yes, even amputations of fingers due to flexor tendon phlegmons are not uncommon. An early detection and treatment of the infection certainly lowers the risk to endure the loss of a limb. In individuals with weak immune defenses such as diabetics, rheumatism patients, dialysis patients or patients with malignant diseases the likelihood of amputation as potential complication is rather high. A deep-laying hand infection may even advance to a life-threatening risk in patients with weak immune defense.